Inshore the reefs are heating up, literally. The bite can get a little slow during the heat of the day. Early and late bites are the most productive. The time from just before sunset to just after dark produce some of the fastest action that the reef has to offer at any time during the year. 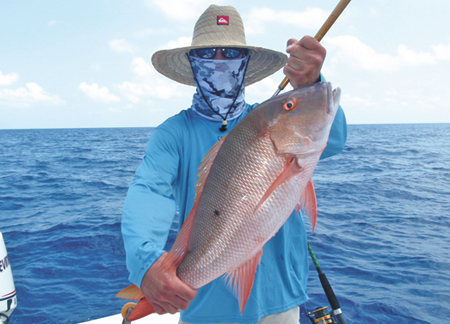 Mangrove snapper to the five pound range will crowd the back of the boat to take a turn in the chum line. A small pinfish will have about a thirty second life expectancy at best. With all that is going on early or late what is there to do without traveling half way to the land of Cuban cigars? I recommend the deep wrecks and reefs just outside of the reef line. There is a great variety of snapper to be found along with some tasty jacks. Mangrove, mutton and American red snapper can all be caught on the deep reefs and wrecks in the Lower Keys. The variety of tasty jacks found out there is also varied and includes almaco, amber jack, African pompano and yellow jack. The deeper of the wrecks will also have a variety of tuna including black fin, skip jack and the fun but less tasty little tunny. The fall fishing on the wrecks is often slower than during the spring mutton or amberjack spawn however, it is usually the most productive daytime fishery going. The majority of fish will fall for a large live pinfish however, don’t neglect to drop a speed jig now and then. The majority of snapper and jacks fall to the pinfish however the majority of tuna will be taken on the jigs. We rig our deep rods with fifty pound spectra like Power Pro and Berkley Big Game. I like to use a thirty pound spinning rod with a relatively stiff action. I match this to a Penn 950sm – it holds over 550 yards of fifty pound spectra and has a drag that will stand up to anything in our waters. The smaller diameter of the spectra fiber makes your drops straighter without all the bow in the line from water resistance. The spectra fiber line is also practically stretch free and you will be able to feel even the slightest strike even in extreme depths. For leader we use fluoro carbon. We splice on a twelve foot section directly to the spectra with an eight turn uniknot on the spectra side and a three turn uni on the fluoro carbon side. The knot is very strong and relatively small and fast to tie. On this first section I slide a four ounce egg sinker and separate the next section with a barrel swivel. The last section is another twelve foot piece of fifty pound fluoro carbon and finally an eleven/o circle hook. Lip hook your pinfish and send it down. If the wind is blowing you might need to keep your boat in reverse into the wind to slow your drift and keep your line closer to vertical. Needless to say you need to pay strict attention so as to not foul your lines in the props. It is greatly helpful to have a full transom boat when backing down in open water. Whether your bite comes from a snapper with its soft nibble first then the steady pull of the hooked fish or a jack with the distinctive bump then the doubled rod soon to follow your action should be the same. Do nothing until the rod is firmly bent or drag is slipping from the reel. Only then should you go into the pump and wind motion. Whether you fish the rod from your hand or a rod holder you should never set the hook by pulling on the rod. The circle hook must slide to the corner of the fish’s mouth and imbed itself. Setting the hook in the conventional method will usually just pull the hook cleanly from the fish’s mouth. For this season, anyway, deep dropping in water more than 250 feet for species such as snowy grouper, blue line tilefish and Warsaw grouper will have to wait. The south Atlantic council has recommended that the prohibition be lifted however, as of this writing the recommendation has not passed so deep dropping is still off limits. For this season, anyway, when we are trolling along offshore we will be keeping an eye on the depth finder for likely deep drop spots for next year.